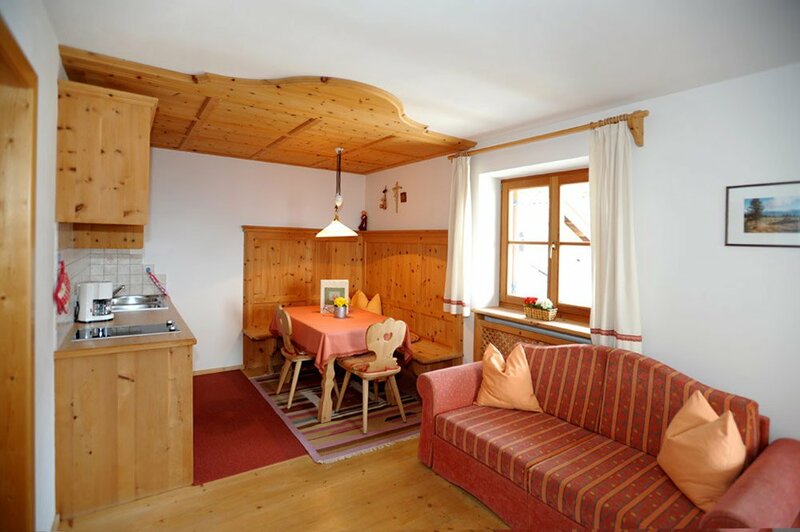 The holiday flat Sella is, like all of our flats, very comfortable andfurnished in wood. Off the balcony you have a wonderful view on the Dolomites, especially the Sella group. The holiday flat is composed of a comfortable eat-in kitchen, a bedroom and two bathrooms. The living space is outfitted with a wooden paneling from pine, which gives the flat a comfortable atmosphere. Be ready to enjoy the beneficial fragrance of the South Tirolean pine wood and its positive effects, scientifically proven, on your sleep. The ethereal oils of this kind of South Tyrol wood soothe, and decrease the heart frequency, consequently ensuring a better rest and a restorative sleep. Moreover your vitality increases!